QuizCast is the quiz app built for using iPads in the classroom! QuizCast features customizable content, built-in assessment and helps manage multiple devices all at once. QuizCast replaces clumsy classroom clickers and provides a richer, more engaging student experience. QuizCast lets you create your own multiple choice quizzes and practice activities in an online portal, then send them out to multiple devices at once. QuizCast activities can include multiple choice questions with images and text for both questions and responses. Student results are posted online as soon as they complete in-app activities–there's no grading! QuizCast shows you charts and graphs of student activity and progress. You can review individual student results, or see how the entire entire class responds to each question. With QuizCast, there's no need to configure app content on multiple devices. You can manage your activities online and push out new content to all of your students devices with one click. Or, if students are sharing devices, you can log them into the app on any device and their customized activities will be waiting for them. • Monitor student progress with built-in assessment – no grading! It's free to get started with QuizCast with 5 students or fewer. Using QuizCast with more than 5 students may require an online subscription. QuizCast is built on the Studylicious platform. 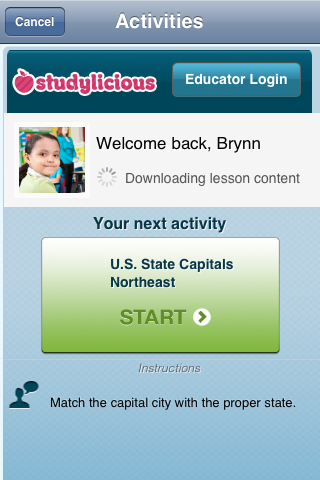 With Studylicious apps and games for the iPad, educators can easily create and distribute their own lessons and then assess their students’ results. Learn more at http://www.studylicious.com.